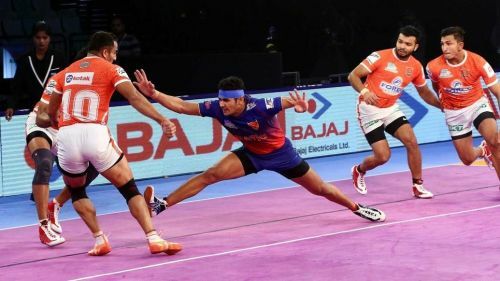 The action resumed after a day's break in the Pro Kabaddi League 2018 as the home side Dabang Delhi KC faced off against the Telugu Titans at the Thyagaraj Sports Complex in Delhi. Telugu Titans came into the match on the back of a three-match losing streak over the past two legs (Ahmedabad and Pune) which put a slight dent in their playoff chances. However, they have matches in hand and with the home leg approaching, can mount a challenge to make it to the playoffs spot. They enjoy a healthy 8-0 head-to-head advantage over the Dabang Delhi KC franchise over the past five seasons. Dabang Delhi won their last encounter at home against the Puneri Paltan and were brimming with confidence having won two of their three matches in Delhi. The raiding department has been a steady performer for them with the trio - Naveen Kumar, Chandran Ranjit, and Meraj Sheykh operating well together. The defence also has been in good touch with Ravinder Pahal, Joginder Narwal and Vishal Mane all pitching in with tackles. The first half of the match started with the Dabang Delhi KC side taking control of proceedings on the mat courtesy the raiding prowess of Meraj Sheykh and Chandran Ranjit. Vishal Mane was the best defender on the mat picking up four points as they inflicted an all-out to take a comfortable lead. Telugu Titans' defence found it tough to get going but Rahul Chaudhari and Kamal Singh did well as the first half ended 21-13 in favour of the home side. The second period of the match saw Delhi continue their hold over the game but Titans managed to get their act together in the end. They scored an all-out in the final raid of the match to get a point from the match with the score at 34-29 in the end. The Dabang Delhi skipper had a quiet night as he failed to score a tackle point but led the side well to keep the Titans in check. The other corner defender of the Delhi side, Ravinder 'The Hawk' Pahal had an off-night as he failed to lock in tackles on the right corner. The cover defender continued his form tonight picking up four tackle points in the first half with his strong blocks and dashes. He ended up with six tackle points in the end including one Super Tackle on Rahul Chaudhari. The all-rounder picked up a solitary tackle point in the first half but was a good support to his teammates in the backline. The promising young raider had a quiet first half tonight with just four attempted raids scoring two touch points. He added one point in the second half and had an uncharacteristic outing from his usual standards. The raider did well in the first period getting five raid points on the board including two successful bonus attempts. He did not have much success in the second half and was substituted after a number of empty raids on the trot. The feisty Iranian all-rounder was in top form tonight for the home side picking up six raids from eight raids in the first half. He managed three points and was a constant threat for the Telugu defence with his tenacity on the mat. The defender came off the bench to replace Chandran Ranjit in the final ten minutes of the match. He scored a stunning Super Tackle on Rahul Chaudhari with a strong ankle hold.